This recent project is special for a variety of reasons. Firstly, the location. Our Divine Design senior designer found herself venturing to the sleepy, Cape Cod beach town of Orleans, Mass. for this one. 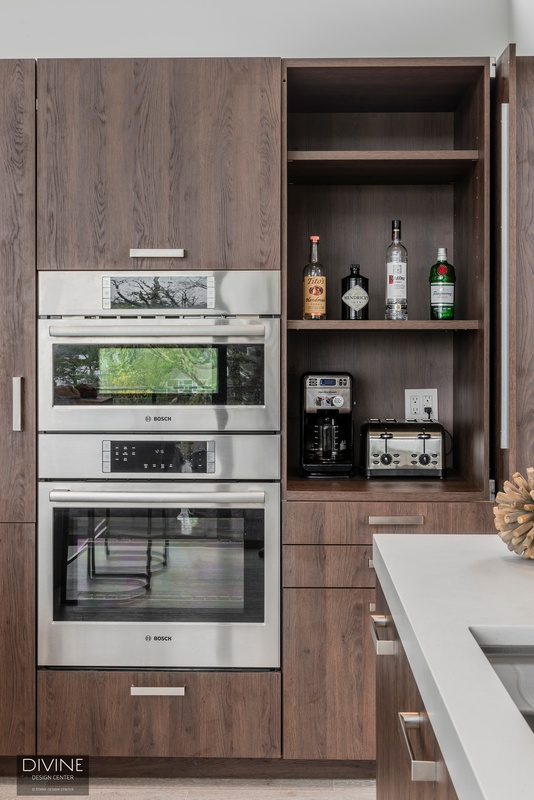 The home, and consequent kitchen we provided cabinets for sits on a plot of thick, green land; subsequently, the new homeowners find refuge in sweeping views of the deeded beachfront property they now have ownership of. Secondly, the homeowners chose to re-frame from the status quo Cape Cod restorations we often see typical of that region. But rather, these Divine Design clients, inspired by contemporary and modernist movements from our past, chose to stray from the restoration process. And, alas, we find ourselves central to a new remodel: a journey through time, a new home referencing the German Bauhaus movement at its fullest. Jana Neudel collaborated with the homeowner, who coincidentally is an interior designer, in supplying modern, German cabinetry to compliment the German architecture of this newly renovated Cape Cod home. Like the before mentioned, the new homeowners of this "rustic" abode created a new space that emanated airiness and contemporary design through innovative architectural feats. The ceiling was raised, the walls are taken to a gallery-white finish, and cabinetry engineered that evoked the indoor theories of the Bauhaus movement, but also conveyed themes central to the naturalists throughout so many art movements. The modern home, which enunciated German design, begged for something similar in its kitchen cabinet features. Thus, the obvious choice in cabinets came from Leicht Kitchens, a German manufacturer, which finds similar inspiration in its modern predecessors like the home in question. 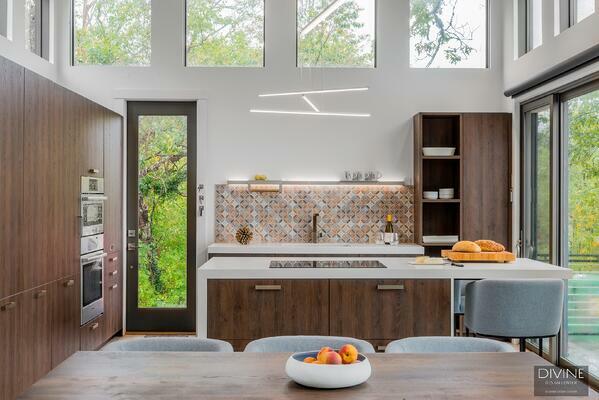 Jana helped design these kitchen cabinets in such a way that they play off of the exaggerated ceiling heights and contrasting light home accents. Au courant aspects of this project stem from the integrated lighting found in the Modo Rail above the kitchen sink and backsplash; but, find further praise in the niche shelving and Sienna program (i.e. cabinet style) from Leicht. 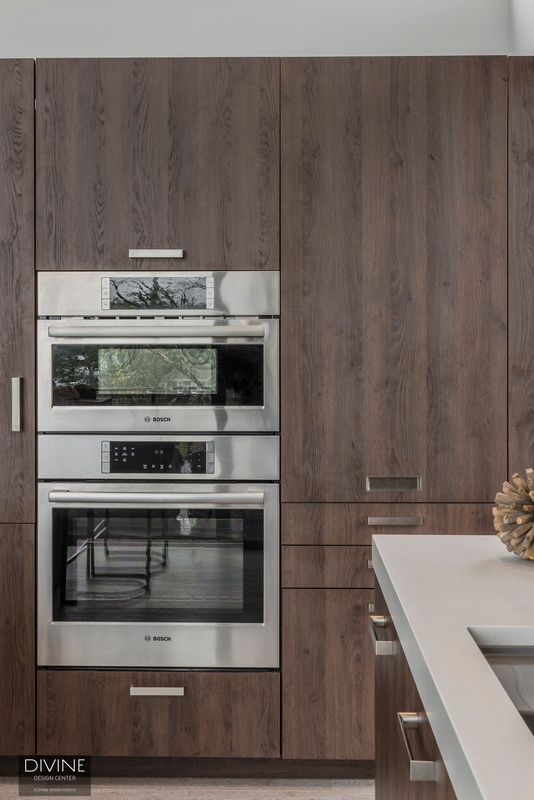 Modern pulls and accessories for the cabinet fronts add a shimmery touch to the more austere, natural wood laminates that side behind them. The wood laminate is an "Oak Havana" finish provided through Leicht's abundance of finish options. To work with Senior Designer Jana Neudel or inquire about Leicht cabinetry for your own home visit our contact page here.